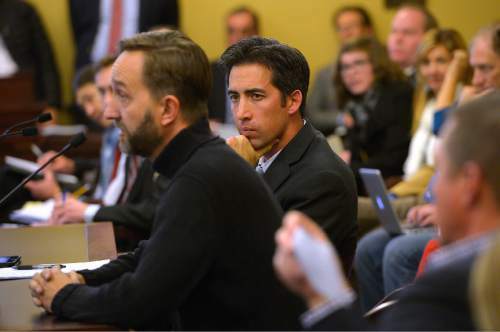 Bluffdale • Some Utah lawmakers want to ban the city from aiding the feds. 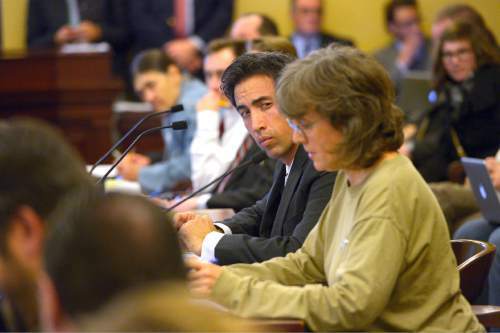 Leah Hogsten | The Salt Lake Tribune "This bill is about civil rights," said Joe Levi, vice chair of Davis County Republicans about the NSA's data collecting during public discussion during the Public Utilities and Technology Interim Committee, November 19, 2014. 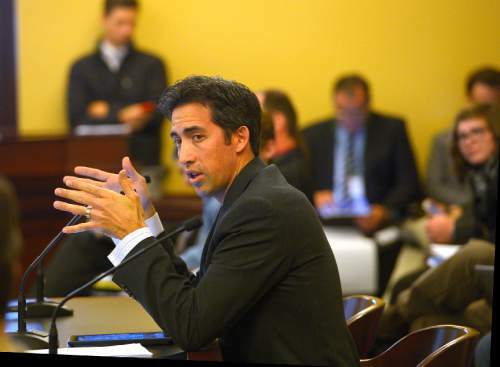 Utah Rep. Marc Roberts presented his draft legislation on the prohibition on electronic data collection assistance to the committee, November 19, 2014. Roberts' bill aims to shut off the more than 1 million gallons of water a day necessary to cool the computers at the U.S. National Security Agency Utah Data Center in Bluffdale. 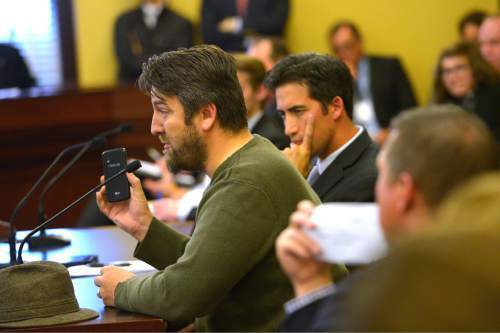 Leah Hogsten | The Salt Lake Tribune Utah's XMission Internet provider and CEO Pete Ashdown (left) gave an explanation of how water is used to cool NSA's data processing equipment to the Public Utilities and Technology Interim Committee, November 19, 2014 during public discussion. Rep. Marc Roberts presented his draft legislation on the prohibition on electronic data collection assistance to the Public Utilities and Technology Interim Committee, November 19, 2014. Roberts' bill aims to shut off the more than 1 million gallons of water a day necessary to cool the computers at the U.S. National Security Agency Utah Data Center in Bluffdale. Leah Hogsten | The Salt Lake Tribune Utah Rep. Marc Roberts (left) listens as Susa Barretta tells the Public Utilities and Technology Interim Committee that NSA could put the nation's utility infrastructure at risk. 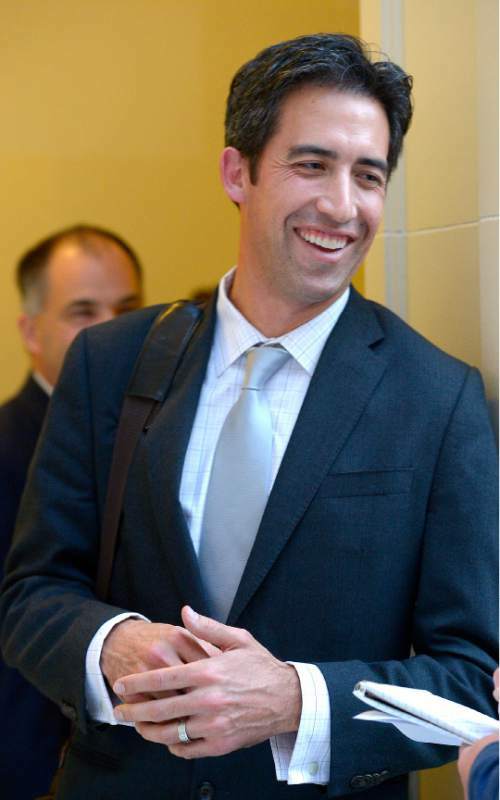 Roberts presented his draft legislation on the prohibition on electronic data collection assistance to the Public Utilities and Technology Interim Committee, November 19, 2014. Roberts' bill aims to shut off the more than 1 million gallons of water a day necessary to cool the computers at the U.S. National Security Agency Utah Data Center in Bluffdale. Leah Hogsten | The Salt Lake Tribune Rep. Curtis Oda reviews the NSA's Data Center water usage summary from November 2011 to March 2014 with other members of the Public Utilities and Technology Interim Committee during Rep. Marc Roberts' presentation of his draft legislation on the prohibition on electronic data collection, November 19, 2014. Roberts' bill aims to shut off the more than 1 million gallons of water a day necessary to cool the computers at the U.S. National Security Agency Utah Data Center in Bluffdale. Leah Hogsten | The Salt Lake Tribune Utah Rep. Marc Roberts presents his draft legislation on the prohibition on electronic data collection assistance to the Public Utilities and Technology Interim Committee, November 19, 2014.Roberts' bill aims to shut off the more than 1 million gallons of water a day necessary to cool the computers at the U.S. National Security Agency Utah Data Center in Bluffdale. Leah Hogsten | The Salt Lake Tribune "I'm wondering why this is even here?" asked Rep. John Westwood of the NSA's Data Center during Wednesday's Public Utilities and Technology Interim Committee as Rep. Marc Roberts presented his draft legislation on the prohibition on electronic data collection, November 19, 2014. Roberts' bill aims to shut off the more than 1 million gallons of water a day necessary to cool the computers at the U.S. National Security Agency Utah Data Center in Bluffdale. This June 6, 2013, photo, shows an aerial view of the NSA's Utah Data Center in Bluffdale, Utah. The nation's new billion-dollar epicenter for fighting global cyberthreats sits just south of Salt Lake City, tucked away on a National Guard base at the foot of snow-capped mountains. The long, squat buildings span 1.5 million square feet, and are filled with super-powered computers designed to store massive amounts of information gathered secretly from phone calls and emails. (AP Photo/Rick Bowmer) Francisco Kjolseth | The Salt Lake Tribune An aerial view of the NSA's Utah Data Center in Bluffdale, Utah, Thursday, April 18, 2013. 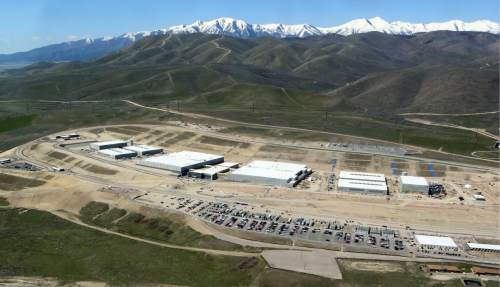 T This Monday, June 10, 2013 photo shows a ground level view of Utah's NSA Data Center in Bluffdale, Utah. The nation's new billion-dollar epicenter for fighting global cyberthreats sits just south of Salt Lake City, tucked away on a National Guard base at the foot of snow-capped mountains. The long, squat buildings span 1.5 million square feet, and are filled with super-powered computers designed to store massive amounts of information gathered secretly from phone calls and emails. (AP Photo/Rick Bowmer) Francisco Kjolseth | The Salt Lake Tribune An aerial view of the NSA's Utah Data Center in Bluffdale, Utah, Thursday, April 18, 2013. T Francisco Kjolseth | The Salt Lake Tribune An aerial view of the NSA's Utah Data Center in Bluffdale, Utah, Thursday, April 18, 2013. T Leah Hogsten | The Salt Lake Tribune "I just don't want to subsidize what they're doing on the backs of citizens," said Rep. Roger Barrus regarding the NSA's Data Center during Wednesday's Public Utilities and Technology Interim Committee as Rep. Marc K. Roberts presented his draft legislation on the prohibition on electronic data collection, November 19, 2014. 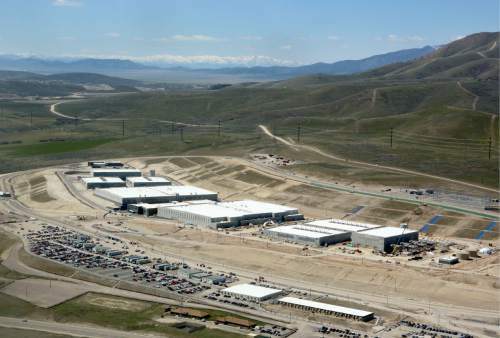 Roberts' bill aims to shut off the more than 1 million gallons of water a day necessary to cool the computers at the U.S. National Security Agency Utah Data Center in Bluffdale. Leah Hogsten | The Salt Lake Tribune Utah Rep. Marc Roberts presents his draft legislation on the prohibition on electronic data collection assistance to the Public Utilities and Technology Interim Committee, November 19, 2014. Roberts' bill aims to shut off the more than 1 million gallons of water a day necessary to cool the computers at the U.S. National Security Agency Utah Data Center in Bluffdale. 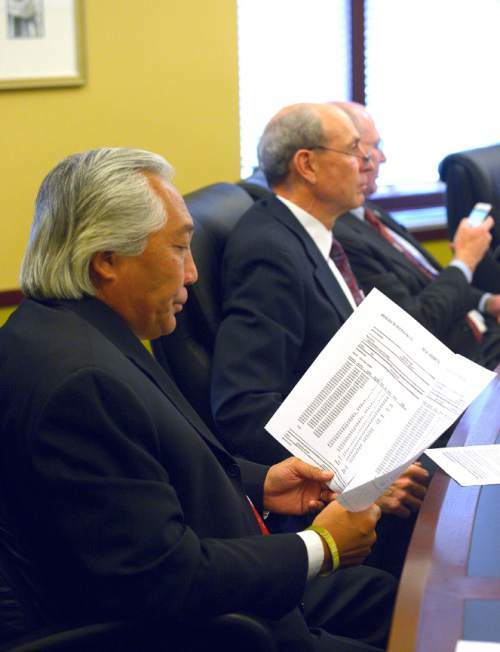 A Utah legislative committee on Wednesday asked a lawmaker to refine a bill that seeks to  eventually  shut off water to the National Security Agency&apos;s data center in Bluffdale. Committee members expressed some concerns with the bill but no outright opposition. They asked the bill&apos;s sponsor, Rep. Marc Roberts, R-Santaquin, to better define who would be impacted by the bill. "I just don&apos;t want to subsidize what they&apos;re doing on the back of our citizens," said Rep. Roger Barrus, R-Centerville. 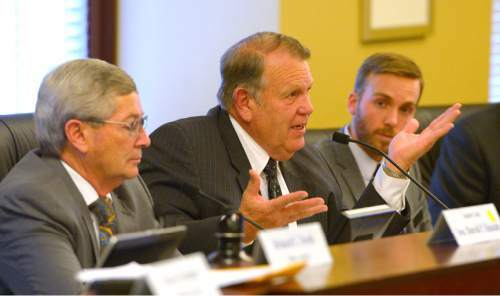 The committee heard a report on how Bluffdale issued $3.5 million in bonds to pay for water lines leading to the Utah Data Center. Bluffdale agreed to sell the NSA water at a rate below the city guidelines in order to secure the contract. Bluffdale leaders believe the agreement will bring long-term benefits to the town by helping finance infrastructure that will attract new businesses. The bill considered Wednesday is similar to one Roberts sponsored in the general session earlier this year. It would prohibit a municipality from providing "material support or assistance in any form to any federal data collection and surveillance agency." 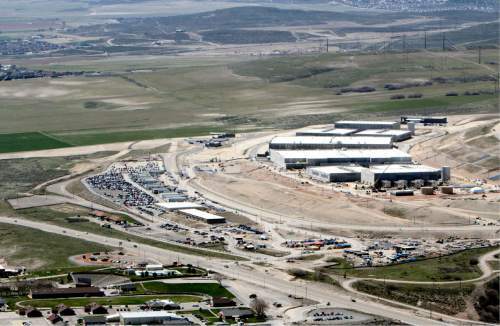 Roberts&apos; bill would grandfather in Bluffdale&apos;s financial agreements with the Utah Data Center, but when those agreements expire, his bill would prohibit further cooperation with the NSA. It also would prohibit any other cities or water districts from signing new agreements with the NSA. Water is a major ingredient at the data center. It&apos;s projected to use more than 1 million gallons a day to cool its computers when the Utah Data Center is fully operational. Roberts on Wednesday told the Public Utilities and Technology Interim Committee that the NSA came to Utah with promises it was acting within the Constitution. "We all know and are aware that has been violated," Roberts said. Committee members expressed some concerns about the state regulating to whom municipalities can sell water. But when it was time for a public comment period, opponents of NSA data collection told the committee that the state needed to take a stand. Joe Levi, the vice chair of the Davis County Republican Party and a Web administrator and senior editor of the website pocketnow.com, said jokes about how the NSA has already read the bill point to the problem with the spy agency. "This is not a bill just about a data center," Levi said. "This is a bill about civil rights." 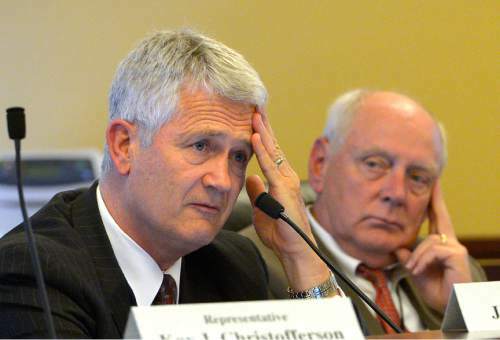 "This data center is a stain not only upon the tech industry of Utah, but upon Utah itself," Ashdown told the committee. Riley Elder, 17, a member of Salt Lake County Youth Council and Herriman City Youth Council, told the committee the issue of digital privacy is important to people his age. "My generation uses technology all day long," Elder said.